Copper Roof and Aluminum Eavestrough – is it a good approach ? HomeBlogaluminum eavestroughCopper Roof and Aluminum Eavestrough – is it a good approach ? The selection of Eavestrough material must account for the potential of Galvanic or Electrolytic Corrosion at contact points with other metals and at supports. Also, special selection is required for corrosive environments such as coastal or polluted industrial atmospheres. 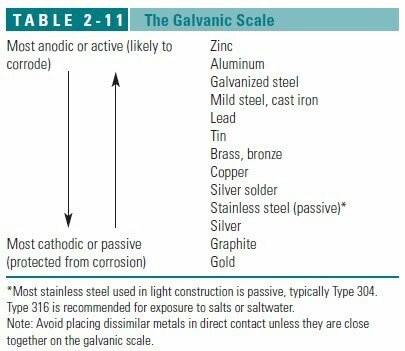 Galvanic or Electrolytic Corrosion can occur when dissimilar metals are in contact in the presence of an electrolyte. An electrolyte is any non-metal substance that will conduct an electric current, especially a liquid solution. Water, particularly rainwater, is a good electrolyte. A galvanic scale has been developed for metals. Metals that are more electropositive (anodic) will corrode more easily and metals that are more electronegative (cathodic) are more corrosion resistant. When two dissimilar metals are in contact in the presence of an electrolyte, the electropositive metal will corrode. The farther the two metals are from each other on the galvanic scale, the speed and effect of the reaction will increase. 1. Avoid contact between metals that are father apart on the scale. electropositive (cathodic) metal. Fasteners are a particular concern in this regard. surfaces at their interface). Zinc chromate or bituminous coatings are often used. (anodic) metal, even if the metals are not in contact. 1. Passivated stainless steel has been chemically cleaned, usually with an acid solution. 2. Anodized aluminum is considered compatible with all other metals. 3. Salts increase the electrical conductivity of water. piping is copper and the drainage goes into galvanized steel scuppers, conductor heads or gutters. (cathodic) copper metal. Galvanized steel nails / fasteners will corrode rapidly if used on copper roofing. 6. Many organizations and individuals have published corrosion tables. All of the tend to rank corrosion rates in non-quantitative terms such as mild, moderate and severe. Rates of corrosion are also affected by conditions such as seacoast, dry inland, acid rain and polluted industrial atmospheres. have any thoughts about this approach? Whenever 2 dissimilar metals come in contact with each other, while in the presence of an electrolyte, a galvanic reaction will occur. The metal that is higher on the nobility scale (Copper) will attract ions from the other metal (Aluminum), causing it to corrode or dissolve. Water is an excellent electrolyte, but just the moisture in the air is enough to get the reaction started, once it starts, you can’t really stop it. If rain water runs across Copper and into an Aluminum eavestrough, the electrolyte (water) will attack the Aluminum. The Aluminum will stain and start corroding, but there are too many variables to be able to offer you a time line. It could last a year, or 10 years. The same would happen with galvanized steel eavestrough. So you have a choice of Copper, Copper clad stainless, terne coated stainless, bare stainless or some kind of plastic. eavestrough (gutters) system with downspouts replacement in Brampton by Maxima Aluminum LTD.